The CGArc Senior Program is a specialty component within the Day Treatment for Adults program. It is designed to meet the physical, social, and emotional needs/interests of seniors (typically over the age of 50) with intellectual and developmental disabilities. Individualized goals center on each participant maintaining his /her personal level of physical activity and mental acuity. Participants enjoy a program that mixes fun activities with the appropriate amount of rest and relaxation. 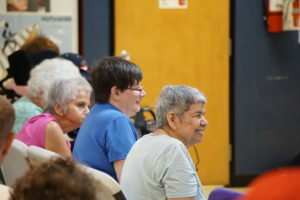 As in the DTA program, participants experience a mix of facility-based fine and gross motor activities, socialization experiences, communication and self-care skills training, with community outings to places of interest such as local senior centers, parks, museums, and other local community offerings. Participants have enjoyed cooking classes, and giving back to the community by helping with local park clean-ups, and running an in-house recycling program. There is a 1:4 staff to participant ratio. Specialized door-to-door transportation is available to persons living within specific geographic areas, depending on vehicle capacity, and staff drivers are fully trained in specialized techniques to meet the unique needs of their passengers.